Ottawa Humane Society: Lydia Gagnon – a true superstar fundraiser for the animals! Lydia Gagnon – a true superstar fundraiser for the animals! We all know that special person in our family, neighbourhood or workplace – the one who is always stepping up and organizing activities, making things happen. The OHS is fortunate to have many special supporters who help the animals in our care – some by giving countless hours of their time volunteering – others who work tirelessly raising money so that we can save animals lives and offer them a second chance at a new life. $1,000 cheque from our friends at Giant Tiger. Lydia Gagnon is definitely one of those special people who will do almost anything to help the animals at the OHS. Lydia has been a walker in our annual Iams Wiggle Waggle Walkathon for seven years. She has been the dedicated captain of her team – F.I.D.O. (Fun Independent Dog Owners) and has led by example by consistently being one of our top individual fundraisers for the walkathon – earning herself the reward of being a VIP Walker! So...how does Lydia do it? The old-fashioned way – with hard work. Lydia rolls up her sleeves and organizes fun activities to help raise her walkathon monies. She has held silent auctions and printed and sold animal calendars to her coworkers, friends and family. This year Lydia has already signed up for our walkathon online and has started raising money for the animals. Her goal is for F.I.D.O. to repeat once again as top fundraising team. 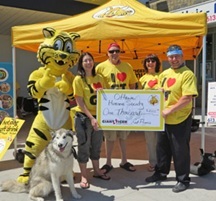 Lydia approached Giant Tiger to host a BBQ for the OHS and raised $1,000 - thank you Lydia and thank you Giant Tiger for this generous community gesture. To date Lydia and team F.I.D.O. have raised an impressive $7,000!!! How can you be a superstar like Lydia? Consider forming a team – we have family teams as well! Set up your personal fundraising page and begin asking your friends, family and coworkers to support you. It’s easy to upload your picture and personal message. If you need assistance – let us know – we are here to help you email walk@ottawahumane.ca! If you want to be pampered and treated to some terrific perks – set your goal to raise $500 and become a VIP walker like Lydia.